The fourth and final adventure in the Little Bo series. For Little Bo, the tiny cat with an extraordinary spirit, and her friend Billy, life just keeps getting better and better. They have traveled from England to France, sailed with the crew of the motor yacht Legend to Italy, and now are enjoying a leisurely cruise through the Mediterranean. But a scuffle with pirates cuts their journey short and calls for the heroic efforts of Bo and Billy. Then a change of course means a triumphant return to England—and Little Bo’s most amazing adventure yet! 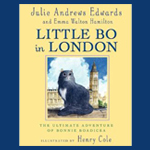 With remarkable courage and the sweetest, deepest friendships, Little Bo’s exciting journey brings her home again and offers a thrilling conclusion to her globe-trotting adventures.